For a long time, application of fire or hot coals was the only way to get metal to reach a high heat, and together with pressure (ie, hitting it with a hammer) with time and patience you could create weapons and other items that were made of metal fused together (this is called forge welding). But, at the beginning of the 19th century, the electric arc was discovered almost simultaneously in two different countries and shielded metal arc welding and its versatile tool the stick welder were born a short time later. An electric arc, in the simplest terms, is the shape that an electric current takes as it “jumps” from one point to another and ignites the gasses between those two points. This burning gas is hot enough to be considered plasma, which means that it burns extremely brightly, can throw off intense UV radiation, can create noxious fumes that you don’t want to inhale and is extremely likely to make your nice unmarred flesh resemble a roast suckling pig if it makes contact so BE CAREFUL. During the Taming Metal session at Weekend at the Asylum the panelists didn’t get to spend too much time on any one method, but this was definitely Trevor Frank’s favorite. Stick welders are especially easy to use nowadays because of advancements that keep unwanted gasses from the air out, thus creating a more stable and predictable arc. You definitely must use a mask that covers the full face to protect your skin, eyes and lungs. Frank and others mentioned developing something they called “the welder’s nod” because of deploying their mask with a nod of the head. Plasma burns so bright that the eye part of a welding mask has to be so dark you cannot see what you are about to weld when you have your mask on. So the artist can lift their mask, get their pieces into position and right before they ignite the plasma they give a sharp nod of the head to bring the shield down. But masks have also been coming a long way, and there is now a type that darkens to eye shield the moment the arc is struck, thus saving your neck from all that nodding. There are many different kinds of welding, but for the non-professional, stick welding is a great method that their portability and relative ease of use. 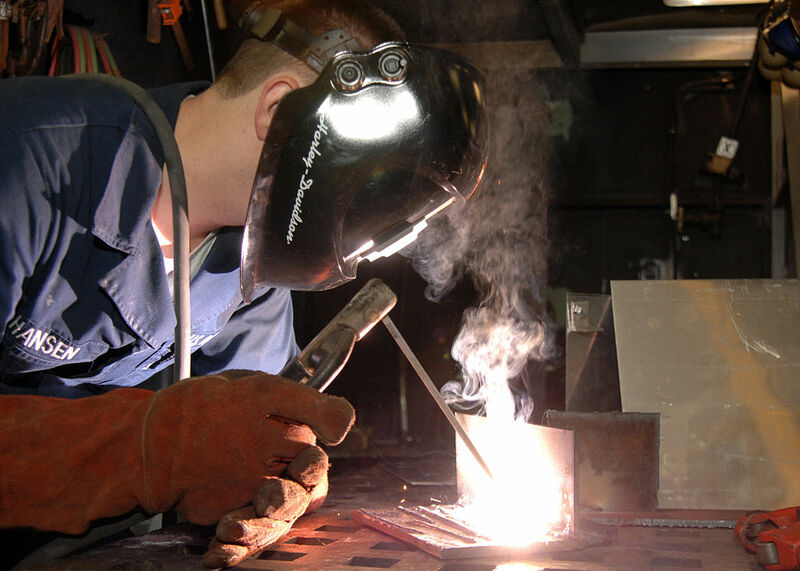 There are some welding methods that use open (and extremely hot) flames in the form of torches. Personally, I have used a cutting torch to do some freehand sheet metal art, but I have never actually done welding myself. So in lieu of giving you bad information, I wanted to provide some links to resources instead. This entry was posted on October 14, 2014 by Phoebe Darqueling. It was filed under Artwork, Conventions and Special Events, DIY and Crafts, Steam Tour and was tagged with Brass, Copper, DIY, Making, metal, steam punk, Steampunk, Steel, Stick welder, Torch, Weld, Welding.